Amidst the growing number of pavement-focused car-based crossovers, Toyota’s venerable 4Runner proudly stands out as a genuine off-road capable utility vehicle that stubbornly adheres to its truck-based ladder-frame roots. On top of this rugged platform, the TRD (Toyota Racing Development) Pro package piles on plethora of exclusive options and equipments to transform the base 4Runner into an even more capable go-anywhere-vehicle that can keep up with Jeep Wrangler on the infamous Rubicon Trail. 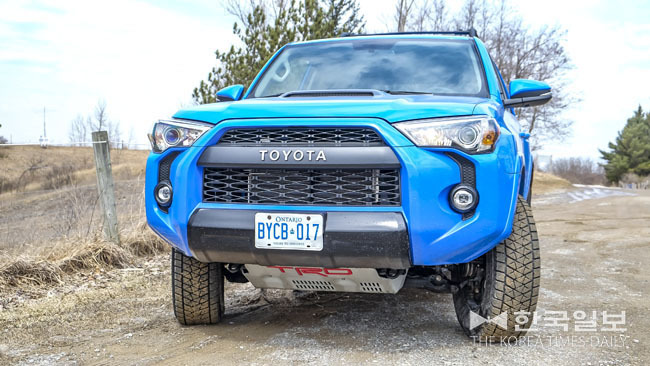 In this digital age of technological advancement, the 4Runner TRD Pro remains old school in ways that is endearing to this middle-aged writer. Case in point: how many people still remember putting the ignition key into the slot and twisting it to start the car? How confident are you driving down the road without the horde of electronic nannies chiming in to keep you in your lane, tell you of pesky pedestrians coming out of nowhere or put on the brakes to avoid collision? 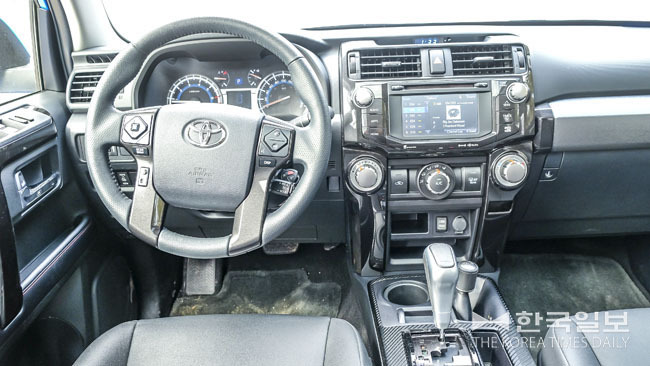 On the 4Runner, you are refreshingly free from all these nagging and second-guessing and this might even make you a better driver by forcing you to pay more attention on the task at hand. Also, unlike many of today’s AWD systems that automatically assume the driver to be an idiot and refuses his/her involvement altogether, the 4Runner TRD provides separate control to let the driver choose manually between two-wheels and four-wheels (low or high), as well as lock the differential, set the crawl speed and select the terrain settings from snow, mud, sand, rock, etc. Some customers might balk at this, but the 4Runner’s inherent goodness does not come cheap with the MSRP starting from $46,155 before taxes, destination and other annoying fees. 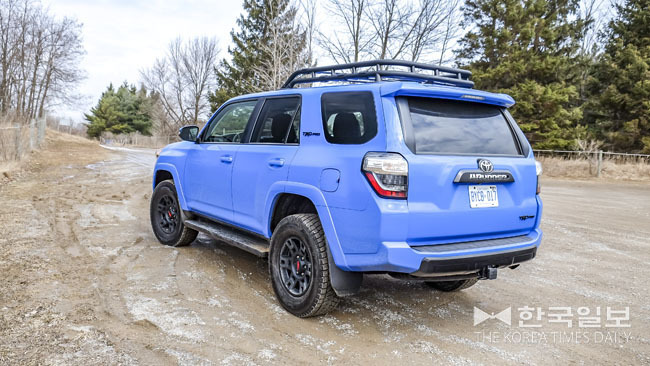 The TRD Pro package then adds $10,425 worth of lever-type 4WD selector, 4-wheel crawl control, multi-terrain select, rear-differential lock, TRD-tuned front springs, Bilstein high-performance shocks, Nitto Terra all-terrain tires and 17’ matte black wheels, aluminum skid plate, roof rack and so on. 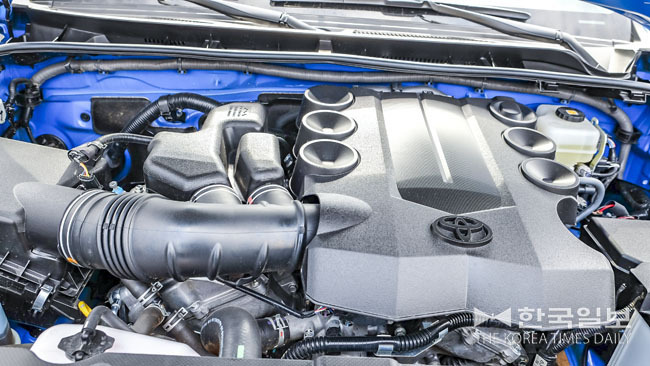 The test-vehicle provided to this writer shows off the specially mixed blue paint Toyota calls ‘Voodoo Blue.’ This paint definitely seems to have bit of magic in it to turn heads and invite closer scrutiny. With squinty headlights, massive blacked-out grill and what looks like large scars running down each side of face, the truck stares at you menacingly. The hood scoop enhances the aggressive demeanour, but unfortunately, it’s fake. The truck sits high off the ground and the large wheels and thick side-walled tires, as well as the taller roof rack make you want go chasing rhinos into the African savannah. The roof rack, however, becomes a point of concern whenever entering garages and underground parking lots. This writer’s condominium complex has high ceilings but some of the overhead pipes seem to dangle low enough to bump against the rack. Thankfully, they only looked that way. The naturally aspirated 4.0 litre V6 provides adequate power of maximum 270 horses and 278 lb-ft of twist. This loud power-plant sends torque to rear or to all four wheels through an ancient five-speed automatic transmission. Yes, I said FIVE speed. This transmission, however, has proven its reliability and shifts smoothly without hunting for gears. The truck feels heavy, though (because it is), and one has to press down on the brakes early. The old school charm (?) carries into the vehicle’s interior. The driver is perched high and thus, his/her field of vision is excellent all around. The heated leather seats are fairly comfortable and the rear passenger space is roomy with tons of headroom. The TRD package eliminates the third-row seats, but that’s hardly a deal breaker. The instrumentation is basic and the tiny touch-screen and its graphics belong to something at least five-years-older. Still, all the knobs and dials are intuitive and easy to use. Several switches and dials, including crawl speed and multi-terrain selector are positioned in the overhead console, in front of the power moonroof, giving the truck a bit of airplane cockpit vibe. The TRD Pro even has navigation, satellite radio and its audio quality is better than expected. The truck, of course, is geared towards off-roading and outdoor adventure and all that but it is also a fantastic urban-assault vehicle. It is unperturbed going over any road surfaces, smooth or broken. Potholes? What potholes? Thanks to soft suspension, ride is smooth and comfortable.